Alfreton Town boss Chris Moyses hailed the importance of Tom Allan to the Reds after he earned a point in the 1-1 at promotion-chasing York City. York resident Allan headed home Brendon Daniels’ free kick seven minutes before half-time to help Alfreton’s fight against relegation. The point left them three points clear of the National League North drop zone. Moyses said of Allan: “He is a massive threat, both attacking and defensively — a good player. The Reds found themselves a goal down after just five minutes when Simon Heslop was allowed to score with an angled drive from a quickly-taken free-kick that caught the defenders out. Perseverance was the key word as Alfreton plugged away in search of an equaliser. Nyal Bell missed a relatively easy chance in the 34th minute, when put through by James Baxendale, before Allan struck. 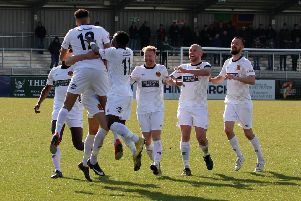 The best chance of a dour second period saw Marcus Marshall guide a back-post header across the face of goal from another accurate Daniels free-kick on 49 minutes. As the hosts toiled in front of their increasingly frustrated supporters, Cieron Keane was only just beaten to a loose ball by keeper Adam Bartlett with seven minutes remaining. York had their chances with Reds’ keeper Viktor Johansson called upon to make crucial saves from both Alex Pattison and Alex Kempster, but the play-off hopefuls were comfortably kept at arm’s length by a determined Alfreton rearguard. Moyses said he was delighted with the result, but wasn’t happy with the first half performance. “l thought we were off it and very naive for their goal,” he said. “We switched off completely and allowed a quick free-kick to take place. “After a few hard words at half-time we did well in the second half, to be fair. “We were always in the game against a good side that are in the play-off positions. “Our fitness levels are excellent at the moment — we’ve done a lot of work on that. On Saturday the Reds face AFC Telford United, who occupy the third relegation spot. Moyses said the draw at York have them gave his side some momentum ahead of the vital game. He does not know if keeper Chris Elliott will be able to return for the crunch fixture after suffering a broken nose against Salford. “We thought he might have been available (at York), but the mask that we are getting hasn’t been forthcoming yet.